For those who follow my other blog (now terribly neglected), you'll know that I'm an advocate for weighing your camper and tow vehicle. 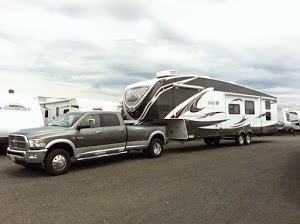 Trucks, SUVs, (even cars), and campers all come with a handful of weight ratings that are specified by manufacturers. I find it useful to know my weights as I like to stick within a manufacturer's published ratings. As I have weighed, each time I was surprised at how much our stuff really weighed. I've even built a website for people to plug in the resulting numbers to "crunch" them and make sense. I typically just stop at a truck stop and am weighed at what is called a CAT Scale. This is what big rigs do to verify that they are road legal. There are 3 scales and you get weights for your truck's steering axle (aka front wheels), it's drive axle (aka rear wheels), and then the camper's axles combined. This is good because you can verify overall numbers, but it can be better. How can it be better you ask? I'm glad that you did. Or you didn't and you're still reading. Sucker. Most RVs aren't perfectly balanced. If you have 2 or 3 axles, you'll find that one side carries more than another or the front carries more than the rear. You can't easily tell this at CAT scales without some fancy footwork which may or may not be possible or even against the scale's rules. To find this out, you need to have a set of scales that can be placed under each wheel and get individual weights. There are a few providers of weightings like this. The challenge is that these locations usually aren't convenient to wherever I happen to be. But, I found that Escapees SmartWeight has a location that was about an hour away from the Thousand Trails Orlando campground. 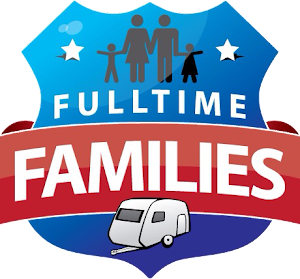 Even better, my membership to Fulltimes Families also got me 1 year free included in Escapees. Winning! The website reported that they only do weightings on M-F and limited hours. Fortunately, Al (the scalemaster) told me it was no problem to do a weighing on a Sunday outside of the established hours. Woohoo! By the end of the weighing, you get a sheet of paper that tells you individual weights for each wheel location for both the truck and RV. It also records those weights against what your manufacturer's ratings are. This helps you to know if you are under, at, or over any specific ratings. We pulled up to the campground and the scalemaster got me arranged on the pad, lined up the scales, and recorded each weight. He would zero out the scale, have me pull on top of it, and then have me move onto the next position. All told, it didn't take all that long to do. Sadly, I had to be the bad guy and throw Lisa out of the truck for the weightings. They want your vehicle as close to how you normally travel as possible. After weighing the truck and camper while they were hooked up, Al had me unhitch the camper and pull around for another set of weights for just the truck. By the end of it, they gave me a rather comprehensive form filled with my weights. Truck's Total Combined Weight Rating: 28,000 lbs. Total Combined Weight: 25,340 lbs. We were carrying almost a full tank of freshwater (42 gallons) and a full water heater (10 gallons). Combined, this was 50 gallons of water at 8.3 lbs. per gallon (so, 415 pounds was simply water); I'll definitely carry less. Basically 10 gallons in the water heater and maybe another 10-20 gallons in the fresh water tank. Those alone will put me within my ratings. But I'd still like to be further under- I do still want/need to pickup a grill (either a Weber Q2000 or O-Grill). And, while fun, I don't really want to have to keep shouting across stores- "no you can't buy that, the camper is already overweight!". And yes, I really have been doing that. The one rating that I'm most bothered by is being right at (and even over on one) my tire maximum loading capacity. Tire damage is bad. Wrecks caused by a blowout is worse. To combat that, I'm already running a tire pressure monitoring system on most of my tires (I still need to sort out my truck rear tires due to the dually).